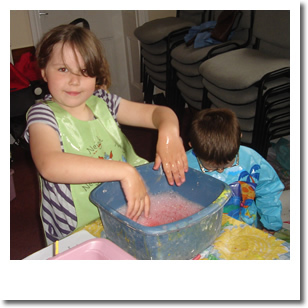 Messy Church started in autumn 2011 and is a regular Mission Community activity, usually held once a month. There is also a Messy Tent at the annual Cottage Garden Show each year. 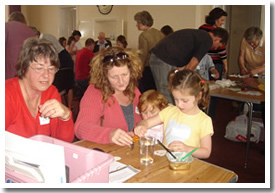 Messy Church consists of several craft activities in the Church hall, followed by a short service in the Church before a communal meal back in the hall. The Reader currently leads the craft activities and the act of worship. So far most activities have taken place in Ipplepen as the hall is the largest in the three parishes, but it is hoped to rotate meetings with the other parishes. There is a small planning committee, and several volunteers from all three parishes help with crafts and catering . 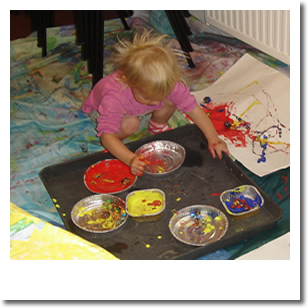 Messy Church is open to families in the Mission Community whether or not they attend Church. To date people have also joined in from several surrounding villages. It is not a crèche or a traditional Sunday School, but all family members stay to join in the activities together. Attendance has been good each month and feedback has been overwhelmingly positive. 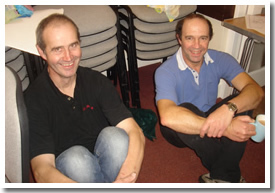 The Mission Community has received a grant from the Diocese, part of which is for the costs of running Messy Church and this is being used to cover expenses where donations from those attending do not meet costs.